Disclaimer: The following are my opinions based on personal experience with the products discussed. I am not endorsed or compensated by any brands and the views expressed do not reflect those of the company that employs me. It’s a great time to be a gamer. The November release of the Xbox One X is really just around the corner. (I can almost taste it!) With Black Friday shortly after, there’s no time like the present to start thinking about how a new Ultra HD TV can make the most powerful console ever truly shine. This holiday season will bring a lot of really cool new tech into people’s homes, but with all the options out there, it can be hard to know where to start. That’s why we’re here with an introductory buyer’s guide for 4K TVs. First, I need to cover a few basics to get us started. This information only scratches the surface of what’s available. I’m going to cover a sample of what I’ve had experience with. I can’t possibly go into all the specs here, but I encourage you to check out review sites like CNET or RTINGS.com for more in-depth product descriptions. 4K: 2160p, Ultra High Definition. These terms are interchangeable, but the thing to know is that 4K is 4 times the resolution of 1080p (“Full HD”). The higher resolution allows for better color, clarity and contrast, but there’s still a huge range in the capabilities of UHD TVs. More pixels doesn’t necessarily mean better. HDR: High Dynamic Range is what really brings a 4K TV to life. The more realistic contrast is what makes the picture pop. Many people comment that it almost looks 3D when they see “true” HDR. A TV that has true HDR can support either the HDR10 or Dolby Vision format . Motion Clarity: Sports, action and gaming fans all benefit from a higher refresh rate which will help eliminate motion blur. Most 4K TVs are going to have a native refresh rate of 60 or 120Hz. That number is a measurement of what the panel is physically capable of. However, with the magic of processors, the TVs are able to appear to be running at a higher refresh rate. Each brand has a different name for its effective motion rating and the numbers can get kind of ridiculous. The thing to really take note of is the native refresh rate. Entry-Level 4K: UHD TVs without all the extras, basically. They are typically native 60Hz panels with processed HDR (meaning they don’t support the HDR formats, but are able to approximate it). Many people are happy with entry-level 4K TVs. If you don’t mind the specs, you could take home a great-looking TV without breaking the bank. Alright, so without any further ado, here’s what some of the big names have to offer. What better place to start than Microsoft’s recommended TV for the Xbox One X? The QLED is Samsung’s flagship TV. The most bright and colorful in the market, this TV works great in environments with a lot of ambient light. They even have a special coating to reduce glare. It’s also got an Infinity Array backlighting system, which provides better light control than edge-lit TVs. The Xbox One X pairing makes sense since Samsung’s Top Model sports the best input lag compared to the other big brands’ premium TVs (20-25ms in Game Mode). The thing I love about the QLED is that it exemplifies Samsung’s “TV for any room” vision of aesthetics. This thing is downright beautiful and comes with so many little design features that it deserves to be the centerpiece of your family room. So, yah, I drool over this TV on an almost daily basis, but the lowest level QLED (the Q7F) in a 55” goes for $2,500. Not only is that a pretty big investment, it’s also a size that I, personally, wouldn’t want to use for gaming in the space I have. 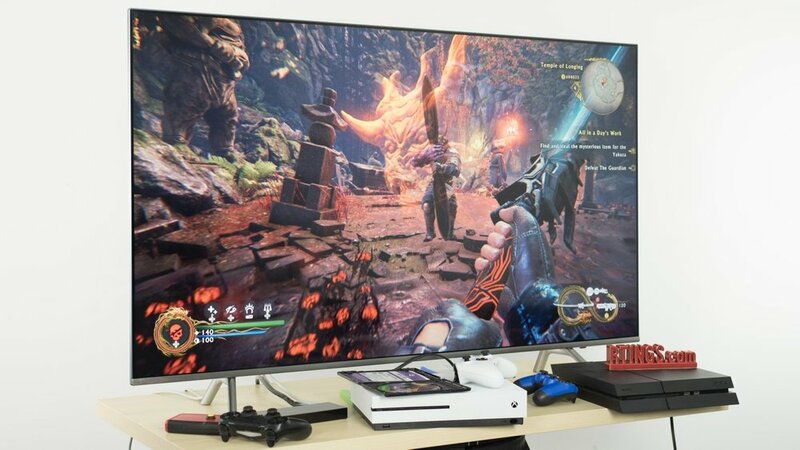 Unless you’re sitting pretty far from the TV, I wouldn’t suggest gaming with anything bigger than a 49” and the 55” is the smallest QLED TV. To get a 49” from the Samsung UHD line, you’d have to go down to the 8 series (MU8000). An edge-lit TV, the 8 series still has a native 120Hz panel. It doesn’t have as many colors as the QLEDs or even the 9 series, but it’s still pretty bright. At $1,200, it’s a good choice for premium quality in a decent size. So if we’re sticking with 49” TVs, the OLEDs are all a wash. Both LG’s and Sony’s start at 55”, but they are some of the best TVs on the market and worth discussion. OLED stands for Organic Light-Emitting Diode. Where the QLED has an array of LED backlights, the OLEDs are backlit at the sub-pixel level. It’s actually kind of mind-blowing. Each pixel is controlled individually which means it can be turned completely off to create perfect blacks. There’s also more control to fine-tune color and they technically don’t have a refresh rate. If you haven’t seen one in person, I would highly recommend checking them out. They are popular with fans of the old plasma TVs; the richness of the picture is unbeatable. There are some downsides that anyone considering an OLED should be aware of. Most importantly, they can’t get as bright as other UHD TVs, even within the same brand. They’re good for the basement, or watching things in the dark. LG has made some strides in glare reduction, but it can’t hold a candle (haha) to the LEDs. For a 55”, the low-end OLEDs can range from 3 to 4 thousand dollars..
Sony TVs are known for having the best processors, which give them a leg up in motion clarity and upscaling. The TV Sony promotes for pairing with the Playstation 4 Pro is the X900E which has a suggested retail of $1,200 for a 49”. The 900 has a full array backlight similar to the QLED, and a native 120Hz panel. These features combine to showcase the HDR and slick motion on the newer consoles. For $850, stepping down to the X800E gets you an edge-lit 49” with a 60Hz panel. For me, the 800 still outperforms comparable 60Hz TVs because of Sony’s X1 processor; the motion seems a lot clearer, but that’s something you’ll have to judge for yourself. The most important thing to remember when purchasing a 4K is that more pixels doesn’t always mean a better TV. A brand new 4K TV can be a big investment, especially when you consider all the peripherals that go into getting the best UHD experience (new HDMI cables, 4K Blu-rays, audio system, etc.). It’s no wonder people are looking for the best deals on the new technology. There are lots of brands that are offering unbelievable prices, but you have to know what you’re sacrificing to get 4K that cheap. A lot of these TVs are what I like to call “1080plus”. They offer little more in their 4K displays than the higher resolution. Most of the time (not always), they provide a better picture than their 1080p equivalents, but if you’re hooking up the world’s most powerful console to it, you’re not really reaping all the benefits of that power. If you’re looking for a good deal, it might be worth waiting to see what the big brands have to offer for their entry-levels on Black Friday. Think of it like this: the 4K TVs offered by bargain brands are typically the best models that they offer. They’re built on the same technology as the standard bargain 1080p TVs. On the flip side, with an entry-level 4K from one of the big brands, you’re getting a TV made by the same people who are making the best of the best. It makes sense that the innovation that goes into making the premium TVs will lead to improvements in their entry-levels. This post has been all about the picture quality because that’s really what’s going to make a difference with the Xbox One X. The best way to tell the difference is to see it with your own eyes. Even if you plan on purchasing online, try finding the TV you want on display somewhere. For a good entry-level 4K TV, you should check out LG’s UJ6300. I’ve neglected LG’s mid-range 4Ks, because there’s nothing really special about them, but with the $700 MSRP, the 6300 is a fine-looking TV to take home at a good price. Outside of picture quality, the entry-levels also offer features you may want to take into consideration for when you’re not playing games. For example, there’s the Samsung Smart Remote or the much improved smart TV operating systems you find in the bigger brands. Almost all of the new 4K TVs are going to have smart functions. Samsung and LG have their own operating systems, while the higher end Sony TVs are Android-operated. If you’re hooking up an Xbox, you probably don’t need these features, but it’s important to note that some of them aren’t actual smart TVs, but rather SmartCast TVs. It’s a small difference, but could hinder users who aren’t already savvy with mobile devices. Another small difference is the price cuts you can find due to the removal of antenna capabilities. I’m not going to harp on Vizio. I may not be a fan, but some people really like them. If you like the picture and you like the price, then that’s the TV for you. However, since Vizio 4Ks are technically “home theater displays”, I’m going to leave them out of this discussion for now and name the TCL 49S405 (MSRP: $380) the best bargain. I, like most people, was really skeptical about this TV. Where did they come from? Are they any good? Well, the answer to those questions are China (of course) and yah, they’re pretty good. They gained some popularity recently when they were featured prizes on The Ellen Show. The biggest point of contention with this TV is it’s claim of a 120Hz native refresh rate. At that price, it’s almost unheard of, but the reason why brands have come up with terms for their effective motion rate is to avoid falsely advertising the refresh rate. I’m not saying I inherently trust TCL’s product labelling, but I also haven’t used any sort of scientific method to measure the refresh rate myself. So, who am I to tell? What I do know is that this TV looks pretty impressive when it’s not displayed next to all the fancy premiums. I bought one for my parents, thinking any 4K display would be miles beyond the rear-projection that they had for the last 15 years. When I put that thing on a mount and finally got through all the menus to watch something, I was surprised. Streaming 1080p Netflix, it did a pretty good job with upscaling and when they get some 4K content, it will support HDR10. I mentioned the menus because it’s probably my biggest gripe with the TCL. You’ll notice that a lot of the bargain brands will be Roku TVs. The deal, I’ve surmised, was that they could get a smart TV operating system on the cheap as long as Roku could plaster their brand on everything. The better smart TV UIs appear as an overlay so you can continue watching as you search. Doing anything on a Roku TV takes you into the Roku menu just in case the logo on the bezel and the Roku remote haven’t reminded you enough about Roku… Roku. You probably get my point. I find it annoying, but apparently Roku TV has more apps than any other smart TV. Which is cool, I guess, but the Xbox will always be my preferred streaming device. The important thing to remember is that when you purchase a TV, you’re most likely going to be really happy when you get home with it. This is something you’re going to buy to enjoy, not just some appliance. So, have fun with it. Research all you can to figure out what will meet your needs. Also, don’t lament if you can’t get the greatest and the latest. There won’t be 100 better TVs to compare it to in your home; there will just be your fun new toy. It bears repeating: if you like the picture and you like the price, then it’s the perfect TV for you. Happy shopping!